CODAN CONSULTING has been appointed as the official booking agent for the ECET 2017 that will take place in Berlin 18. - 21. June 2017 and will be happy to assist you with your bedroom reservation or other related arrangements. Below you can see the list of hotels selected for the ECET participants. More hotels will be available soon. 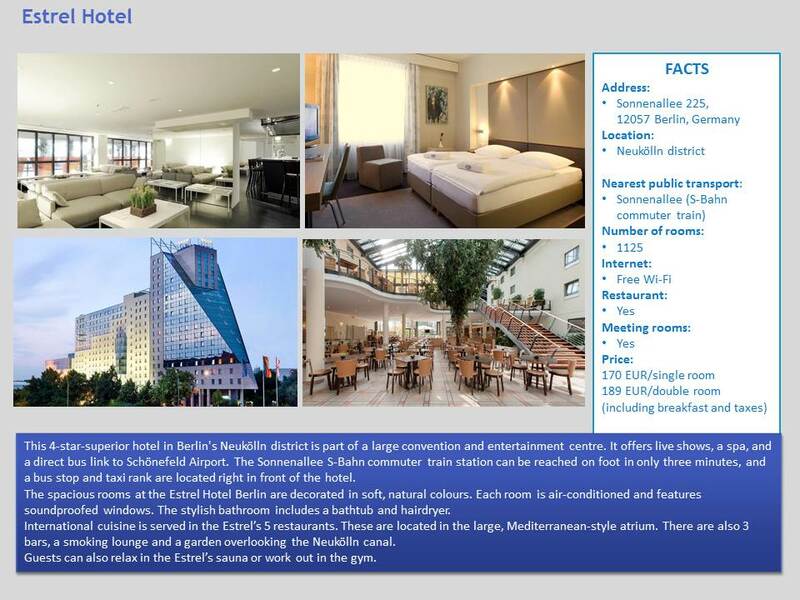 The conference venue, ESTREL Hotel, is located only 13 kilometres from Berlin’s Schönefeld Airport (SXF). The Sonnenallee S-Bahn commuter train station can be reached on foot in only three minutes, and a bus stop and taxi rank are located right in front of the hotel. To see the hotel map of Berlin, click here. Payment for the accommodation via this website will be immediate if you decide for credit card payment, if you will choose payment by invoice/bank transfer - you will receive confirmation email with deposit/proforma invoice to make the bank transfer. Offered bedroom rate includes accommodation, breakfast, VAT and city tax if not specified differently below. Full pre-payment of your bedroom reservation is required prior to the arrival. 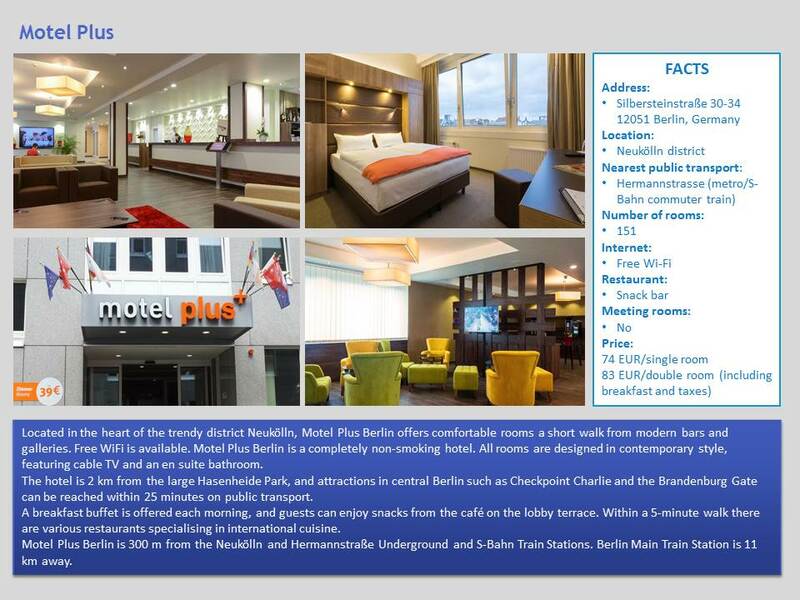 Motel Plus Berlin: Bedroom reservation can be cancelled free of charge till 19.5.2017. Ibis Hotel Berlin Neukölln: Bedroom reservation can be cancelled free of charge till 1.6.2017. 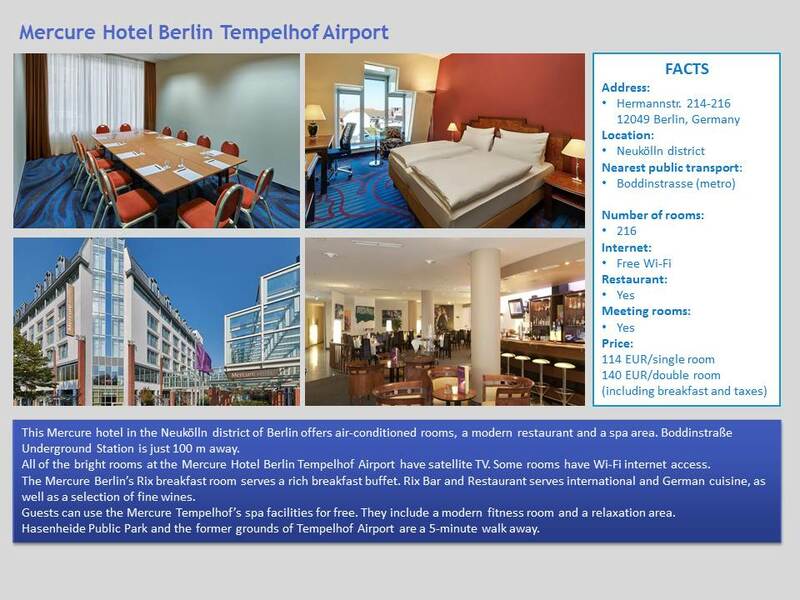 Mercure Hotel Berlin Tempelhof Airport: Bedroom reservation can be cancelled free of charge till 5.6.2017. 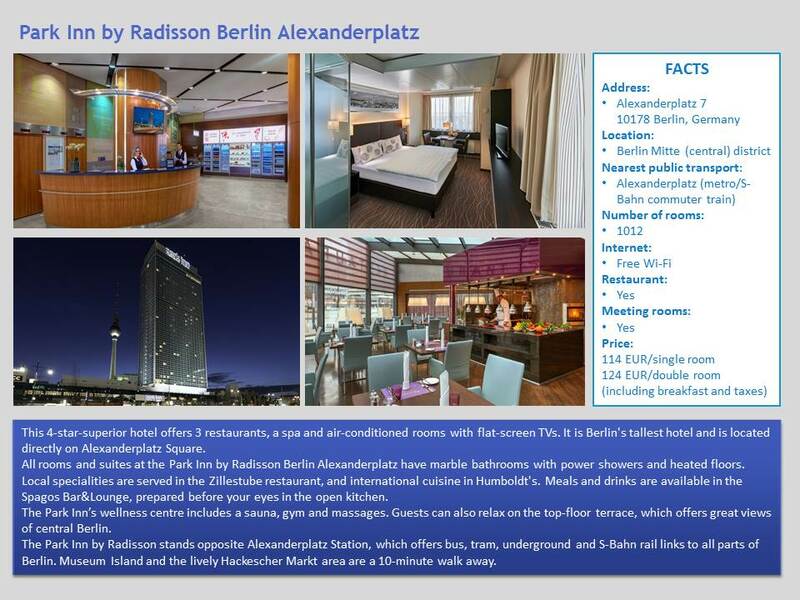 Park Inn by Radisson Berlin Alexanderplatz: Bedroom reservation can be cancelled free of charge till 17.4.2017. Hotel Estrel: Bedroom reservation can be cancelled free of charge till 20.2.2017.